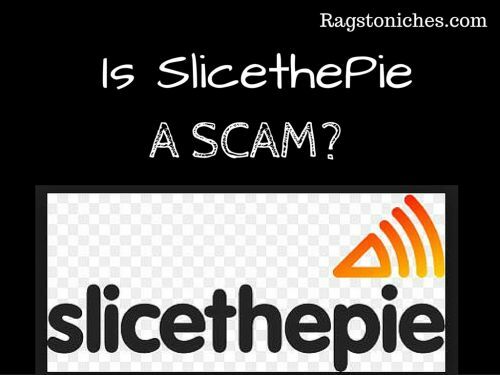 Is Slice The Pie A Scam? Or Legit? Last updated on October 22, 2018 By Nat 14 Comments This post may contain affiliate links. We appreciate you supporting Rags To Niches! Full disclosure here. Can you really make money on this platform? Is Slicethepie a scam… Or a legit way to write mini reviews online for money? In my in depth Slicethepie review today, I will share what I have discovered about this platform since joining. Slice the pie or Slicethepie is a review site. For every little mini review you write, you can earn a small amount of money for your time. The reviews used to just be focused on Music… But there are now additional categories that change. At the time I first joined it was a choice between: Music, fashion, mobile accessories, or a “lucky dip,” option. Well, it’s certainly not a scam and while you can’t make much money here, I actually find the site enjoyable & fun to use. Check out what I made of it below! Cost: Free to join, you get paid! Money Making Potential: Pocket money. Overall Ranking: Legit! 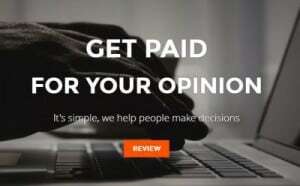 Earn a small amount by writing mini reviews. More for enjoyment than cash really, but can still make a small amount. You will also be able to provide artists, designers and creators constructive feedback. Sign up here. The website has not gone without it’s criticisms and they’re extremely strict if they think someone is gaming the system! That said, they’ve paid me with zero issues at all and I have not had any problems with this site since I joined. Fed up of making peanuts online? You could try this instead! Now, considering the earning potential for this product is extremely low, it’s quite amazing that I have given this site such a high rating! It was like a breath of fresh air to discover Slicethepie. Because this time – it’s not about answering questions. This time, you are simply giving your opinion on a selection of topics, by writing mini reviews. Plus, part of that involves listening to music and giving your opinion. So, enjoyment wise, this is a whole lot more fun. Maybe I am a little biased, since I actually enjoy writing and find it preferable to ticking boxes and answering mundane questions! At the time of writing, there are four categories you can choose to review relate to either fashion, music, mobiles, homeware items – or a lucky dip option. They added the “homeware,” items in 2016, which added a bit more variety. Sometimes a certain category will have BONUS underneath and this means it will pay you more per review. The difference in price between regular and bonus reviews really seems to vary – sometimes it seems to be 20 cents more, other times only a few cents. When you go to write your review, you need to write it in a little box, (as shown above). When you’ve reached you MINIMUM word count, the orange timeline will be full, (You can see it via the arrow in the pic above). When your review is complete, you can rate the product out of 10 and press enter. Normally it goes through, but sometimes it may ask you to elaborate to stick to the point. A couple of times I had to make a couple of quick edits, but 95% of the time it was just accepted. I decided to see how much I could earn in a timed 30 minutes. that’s because I used up all my surveys in the other categories, so it was the only option left. 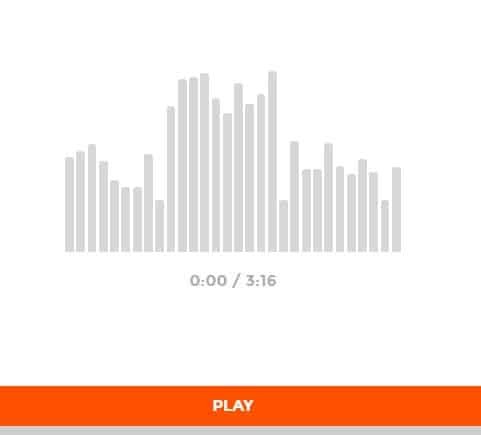 Music takes the longest to review because you HAVE to listen to 90 seconds of music, before you can submit your review. The most time-saving way to do it, is to make sure your review is already ready to submit within that 90 seconds. So, you need to listen and type as you go. There was also no bonus option when I did this. So, really you’ll be looking at the minimum you can earn in 30 minutes using Slice The Pie. At time of starting I had $2.52 in the bank. In cents… 7, 7, 4, 5, 5 ,5 ,5, 6, 4, 6, 4. If I had been efficient, I definitely could have done more. But several songs, I listened through completely. Also, sometimes I’d be told that the review was not concise or specific enough, (this is common). I then had to quickly figure out what you’ve done wrong and correct it. Thereby making all of 58 cents in half an hour. I made the first couple of dollars in around an hour the day previously. So, earnings can definitely vary… buy yup, they are super small. But that’s what you can expect from any similar opportunity online, (survey sites and the like) and AT LEAST with this one, it’s actually fun. You also get to help out up and coming artists or designers by giving feedback on their creations. Your reviews do go straight to them, so they will receive any feedback you provide. If you want to make more money, by referring friends and family to the program via your individual link, you can earn bonus money every time they write a review too, (20% of their earnings). You’re able to withdraw your earnings, once you’ve made a minimum of $10. The withdrawal method is incredibly easy and it wouldn’t take too long to make up the $10 to take out. Remember, you’d have to look at this like playing a game or a mini hobby, it’s not a business opportunity. The way you could make the most money would be referring a lot of people – but even then, it’s hardly a massive earner. Useful post: My favourite extra income sites! You don’t know how much you’ve made for the review, until it’s been written. Very limited earning potential, (seems to have got even less over the last year!). Sometimes it will tell you the survey isn’t concise enough, isn’t written in English, or isn’t thorough enough! Through trial and error, you get to understand slowly what is wrong and what works/what doesn’t. Update: I’ve had a couple of comments on my you tube video for slicethepie that people have reached a certain amount, (in one case $15) and been thrown out for their reviews not being unique enough. However, I’ve been paid with zero problems! A majority of people do get their money just fine and do not get thrown out. What it does mean is that you have to be careful when writing your reviews that they are unique and not just a generic response. Slicethepie are very strict in this respect. Another good idea, would be to withdraw as soon as you reach the $10 mark, rather than leaving the money in there. Conclusion: Is Slicethepie A Scam? Slicethepie is absolutely not a scam. That said, it’s earning potential is extremely low and I wouldn’t recommend that you spend hours and hours of your time on it. Personally, I do feel that this websites quick easy earning potential, along with the fact there is no being “chucked off” as there is in regular survey sites – blows the socks off many similar sites that I have reviewed. If you stick to the bonus reviews too, you will make much more than going with the regular ones. Slicethepie is a straight forward, enjoyable and fun way to build up some extra pocket change on the side. Why go through all the hassle and frustrations that so often come along with survey sites – when you could just sign up to this instead? Or, if you want to increase your earning potential overall – sign up to a select few sites and then you’ll have some variety. Do you want to make real money online – in the long term!? My advice is to not work exclusively for small change – for hours of your time each day. You may make a little, but what will you have to show for it in the long term? These types of sites will only ever pay you minor amounts. Simply doing this alone will not generate a decent side income! Let alone a full-time income, (if that is what you want). They’re fine for a bit of fun in your spare time. The trouble is, people often turn to sites like this when they actually want to make more substantial money — and that won’t work. For a more longer term project, consider looking into building a real long term business online, that can make you substantial money in the future. This place is a good place to get started, as you can get started for free and start learning right away. You can learn step-by-step how to turn your interests into something that can generate you a profit in the future and also be part of a wide community – who all support each other. When you sign up, there is also a free ten part training course members & two free websites included. I hope you found this review useful, let me know how you’re getting on with your online ventures! 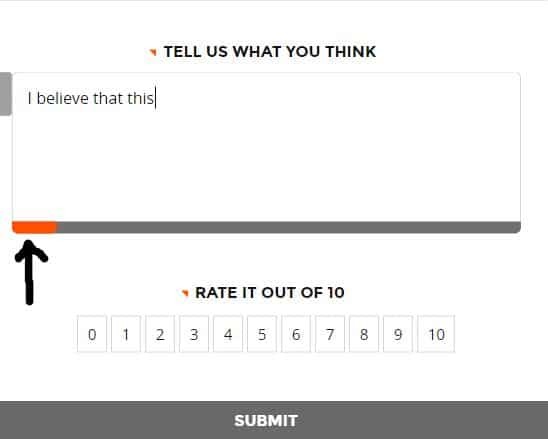 Filed Under: Online Survey Sites, positive reviews Tagged With: is slice the pie legit, slice the pie review, what is slice the pie? First of all I have to say that your website name is spot on 😉 clever! As for your post, I remember always looking through so much content on google as I looked around for ways to make some side money. Review sites which ultimately led to absolutely nothing after investing time, which I’m sure a lot of people have experienced too… So I’m glad to finally hear of one that works. I will recommend your site to a lot of my associates, as it’s what I would have love to come along when I was searching for ways to make income online! Thank you and cheers! Hi! I once heard about slice the pie before, but now I have a really objective vision and review, we need more and more of these kind of reviews about business online, because there are so many scams out there that the people could be a bad time. Great information and very useful. Thanks very much for your comment. Yes, you can only make minute amounts with slice the pie really, but its more fun than survey sites in my opinion. If you want to start from scratch online, I’d recommend you check out this program first. Thanks again! Writing reviews for other is definitely not a good way to make money. Writing for other people is just simply helping them to earn money. And I am not getting what I deserved! Why don’t I just create a website and put the reviews on my website? But of course I should own a website first. Honestly, I usually find reviews difficult to read but this one flowed nicely. I like how you were honest with the amount of money you made in a certain period of time. I like messing with these type of websites in my spare time because it’s better than wasting away minutes/hours doing nothing. Thanks for this! Hi Gina! Thank you – yes, basically it’s ok for a bit of fun. I am still logging in occasionally to see when they have the bonus ones on, it’s quite good to practice quick typing also! Hi. I have never heard of slice the pie. So this new to me. Your site is a good review site. It certainly dissects slicethepie. Adding clips of earnings, and recording is good. It gives the customers a slice of what they will hear. i cannot see slice the pie being beneficial to be honest to anyone. as you rightly said such little earnings for so much time spent. doing surveys give you more money. one thing for sure it does not look like a scam. i always say, you have more reason to believe it may be a scam if the site promising a LOT of money! good review. Hi thanks Arif – no it’s not the route to making any real money. But is fine for a bit of fun really and to earn a few bucks while you do. Surveys are pretty bad as well, for the most part and they can also be incredibly long and dull. What I like about this is that it’s very quick too. They’re also transparent about what you earn and there is no hype, which is decent. I really liked this article. I have tried many of those surveys and have not made any money. Most of the time I spent a great deal of time only to be told that I don’t qualify or they already have enough information in my demographic.Slice-the-pie sounds interesting. The only problem for me, is I am a slow typer. Hi Nat, Thanks for writing the review, I have heard of the survey and review sites but never looked into them. I did hear you needed to be a fast typist just to make a little money. Also the thought of which sites are scams it is great to hear this one is not. I was surprised at how much money you do make writing reviews. Thank you for writing about Slicethepie.